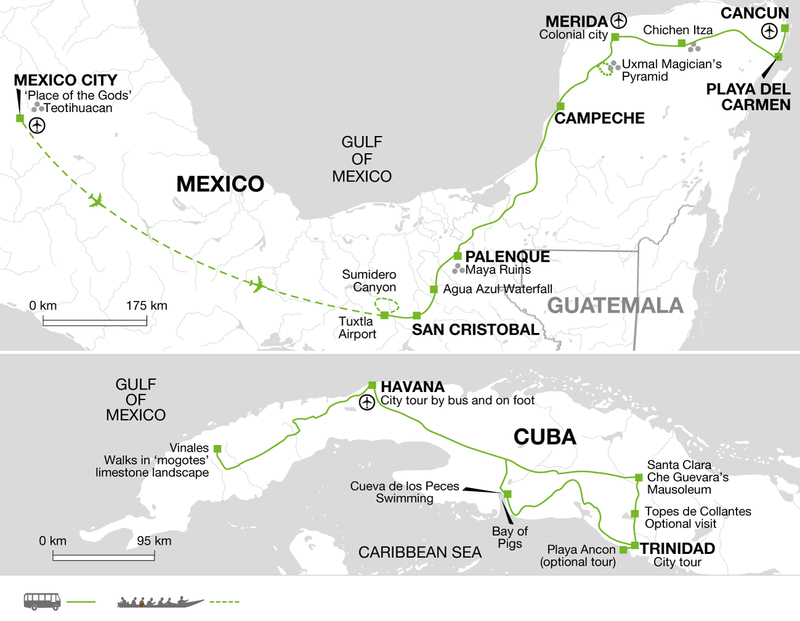 This adventurous journey takes us from the sprawling capital of Mexico City out towards the Yucatan coast at Playa del Carmen, with only a short onwards hop to the culturally unique island of Cuba. We explore indigenous villages and beautifully preserved colonial towns, discovering three different Maya sites, culminating in the famous ruins at Chichen Itza, as well as taking a boat trip through the vast Sumidero Canyon. Flying on to Cuba, the incredible music scenes of Havana and Trinidad await us with cocktails and salsa dancing. As well as the lively city-life and fascinating history, we also discover Cuba's spectacular natural beauty, taking in its pristine beaches, unspoilt forests and the dramatic landscape of Vinales. Now is undoubtedly a fantastic time to visit Cuba to see and experience the island. Visiting Cuba is like stepping back in time as little has changed over the past 50 years. To fully enjoy the Cuban experience you should travel with a willingness to expect the unexpected and, above all, an adventurous spirit. Check-in at our hotel in Mexico City. Modern day Mexico City was built on top of the Aztec capital Tenochtitlan by the Spaniards, after their conquest of the city. Today this busy, lively city boasts a wealth of historical buildings, museums and markets. We have our final breakfast in Mexico this morning, before heading up to Cancun Airport for our flight to Havana. Some members of our Mexico group may be returning to the UK, but anyone continuing to Havana will be booked onto the same flight. This day is unguided, as your Cuban Explore Leader will not join you until tomorrow morning, along with the rest of our 'Best of Western Cuba' tour group. Arriving in the late afternoon, you will journey to your centrally located 'casa particular', or local guesthouse. On arrival to the main 'reception casa' in Havana, you will be met by the host and shown to your room in one of the other casas located nearby. Each casa can only accommodate a handful of guests, giving you a great opportunity to immerse yourself in the local culture. Havana is a fascinating city. In 'Old Havana', Spanish grand colonial buildings rub shoulders with those of glorious art deco style, as the ubiquitous old American cars and taxis cruise past. After years of neglect some of these magnificent buildings are being restored, and it is not hard to imagine back to Havana's glamourous heyday when it was a popular haunt of the rich and famous. One of the first to be restored was the impressive art deco style Bacardi Building. Today Havana has something for everyone including museums, shopping and street cafes. At night the city's legendary music and cocktail bars come into their own. Today, we explore modern-day Havana, with its mixture of restored and crumbling architectural marvels. Walking through the Vieja (old) district, we will discover the baroque cathedral, beautiful neoclassical buildings and the Plaza de Armas (main square). On our travels, we will doubtless see many brightly-painted vintage cars - the result of legislation enforced until 2011 ruling that only cars built before the 1959 revolution could be sold. We may also notice the lack of advertising - nothing but political exhortations are allowed. Passing by the famous Capitolio building, modelled on the White House, we are likely to see kids playing the hugely popular game of baseball in its grounds. During your free afternoon, you may choose to visit the fascinating Museum of the Revolution, housed in the impressive former Presidential Palace. The City Museum is also worth a visit, exhibiting art and historical artefacts in rooms preserved with their original Colonial decoration. In the late afternoon, once the freshening cool breeze blows in from the Caribbean, you may be tempted to enjoy a lively sunset stroll along the Malecon. Alternatively, you may prefer to visit the famous cigar factory. Later this afternoon, we will enjoy a cocktail making class where we can learn to make some of Cuba's famous drinks including mojitos and pina coladas. This evening, we have the option to sample some of the capital's famous nightlife. El Floridita is as celebrated for its daiquiris as it is for having been a favourite hangout for Ernest Hemingway. Likewise, the Hotel Ambos Mundos is another Hemingway landmark where the 1954 Nobel Prize winner and author of 'For Whom the Bell Tolls' lived for several years. Its roof terrace serves up exceptional mojitos - the traditional Cuban cocktail. After travelling a couple of hours west, we reach what is arguably the most picturesque part of Cuba - the Vinales region. Here, surreal mountains jut out of the landscape, formed by the erosion of limestone over millions of years. These 'mogotes' translate as 'haystacks' - a good word for them considering their steep sides and rounded, jungly tops. Around them, the iron-rich, red soil creates a patchwork of fields growing some of the best tobacco in the world - the raw material for Cuba's celebrated cigars. Before our return to Havana for the night, we have the option of a two-hour trek through the valleys of this remarkable landscape to the village of El Palmarito. Mogotes tower above us as we pass through tobacco fields and past drying barns. Today, we head east across Cuba, driving through giant citrus and sugar plantations and out on to the Zapata Peninsula. Our journey is broken up with a wonderful swimming opportunity in a 'cenote' (pool) where the ceiling of an underground river has collapsed. We plan to arrive in Playa Giron by mid-afternoon. Here we will visit the museum dedicated to the infamous 'Bay of Pigs' invasion - a US-supported attack by Cuban exiles which failed to overthrow the Communist regime in 1961. Our journey continues, past the wooded Escambray Mountains and hugging the coastline, with views over the sparkling turquoise waters of the Caribbean Sea. By early evening, we will arrive at our hotel just outside the beautiful Spanish colonial town of Trinidad - our base for the next three nights, where we will enjoy local hospitality staying in casas particulares (private houses). This morning, we wander through the cobbled streets of the old centre of Trinidad, discovering its fine palaces, churches and cafes. A paradise for photographers, this UNESCO World Heritage Site is a perfectly preserved colonial settlement unlike any other. In the early 19th century, French settlers fleeing a slave revolt in Haiti, landed here and started to grow sugar cane in the Valle de Los Ingenios. This crop generated considerable wealth and consequently the town had to be regularly defended from pirates. Subject to opening hours, we will visit a local museum before some free time where you may wish to wander for longer through Trinidad's streets to soak up more of the unique atmosphere. Mid afternoon we will enjoy a salsa dancing class where you can learn some basic steps to perhaps try out later that evening at the open-air Casa de la Musica, just off the main square. Today is free for you to enjoy more of Cuba's beautiful landscapes and fascinating culture at your own pace. You may wish to take the short train journey out to the Sugar Mills Valley to Manaca Iznaga where you will have the opportunity to visit the Hacienda of the Family Iznaga, one of the richest in Trinidad during Colonial Times. Another option is to head into the Escambray Mountains to the Topes de Collantes Nature Reserve Park. With its unspoilt forests and water-eroded valleys, this area is famous for its many endemic species of flora and fauna. There are several different options involving short walks through the coffee growing area and rainforest. Most trips will drive up to some incredible viewpoints and several of the options offer an opportunity of a refreshing swim in one of its waterfalls finished off with a traditional creole lunch in one of the local haciendas. Your leader will run through these different options with you. Alternatively, you may wish to visit the deserted island of Cayo Las Iguanas. Here you can eat fresh paella, relax on the beach and snorkel in the coral wilderness. Snorkelling equipment is not always available, so keen snorkelers might prefer to bring their own. Today we bid farewell to Trinidad and make our way back to Havana, via Santa Clara. This pleasant university town was originally a prosperous agricultural area, well-placed on the island's trading route. Now, it is most famous as the site of the last battle of the Revolution, in which Che Guevara's troops took the city, causing the Cuban dictator, Batista, to flee into exile. After visiting the Tren Blindado Memorial commemorating this historic event, we move on to Che's Mausoleum. Guevara was buried here with full military honours in 1997 after his exhumed remains were discovered in Bolivia and returned to Cuba. A flame lit by Fidel Castro burns eternally to honour a national hero who played a key role in Cuba's revolution and whose image is routinely displayed throughout the country. We will also visit the museum dedicated to Guevara's life, containing many interesting letters and artefacts. This evening, we return to Havana to enjoy a final dinner and probably a dance. Our trip ends in Havana after breakfast. During your stay in Cuba you will be staying in casas particulares - this is a Spanish term meaning private accommodation or homestay. Staying in a casa offers the visitor a unique opportunity to experience Cuban hospitality in local accommodation adapted for tourism. The number of rooms, quality, facilities and access to other areas of the house such as the living room varies massively but as a general rule the majority of Casas are clean, basic, centrally located and can host only a handful of guests. Casas are generally run by the owner and members of the family that live there and the standard of English spoken will vary from zero to fluent, which is a good opportunity for you to practice your Spanish. They are often full of history, family photos and memorabilia, providing you with a deeper insight to Cuban life than a hotel stay. Virtually all of the rooms have private facilities but on rare occasions it may be necessary to share. Your Explore Leader will coordinate accommodation arrangements on tour. Other nationalities should consult the relevant consulate. You should confirm all visa related issues with the relevant Embassy prior to departure. Visiting not just one but two of Latin America's most diverse countries, this adventurous journey is perfect for someone who has only two weeks holiday but wants to explore as much as possible. In Cuba you will stay in Casas Particulares (homestays) throughout, which is an excellent way to see the country.